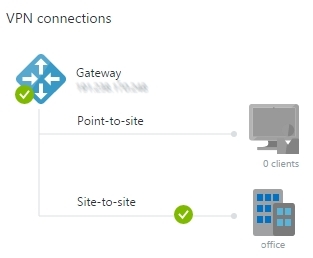 There is an out of the box Azure solution for the site-to-site VPN: virtual network Gateway. It's a fairly straightforward IaaS component that supports site-to-site VPN over IPSec protocol and point-to-site VPN access point. It's well documented on Azure https://docs.microsoft.com/en-us/azure/vpn-gateway/vpn-gateway-howto-site-to-site-resource-manager-portal. Particulars of IPSec configuration are not documented. There are articles written about this scenario on the Internet (just do a search) but even with the most detailed explanation and screenshots it may take some time and debugging efforts in order to make it work. On a flip side, once it works it most likely will be very reliable and trouble-free. Let's waist no more time and get right to the matter. 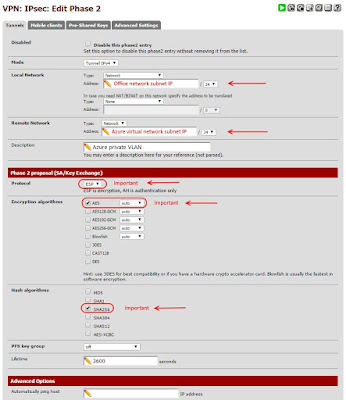 Once you have the VPN gateway created and the VPN device configured, it's time to configure the pfSense. Keep in mind that because the pfSense is not a supported Azure VPN device you won't be able to get technical help form Azure, so pay attention to the details. If you configured everything exactly how it's shown on the screenshots the connection should be established and stay connected. 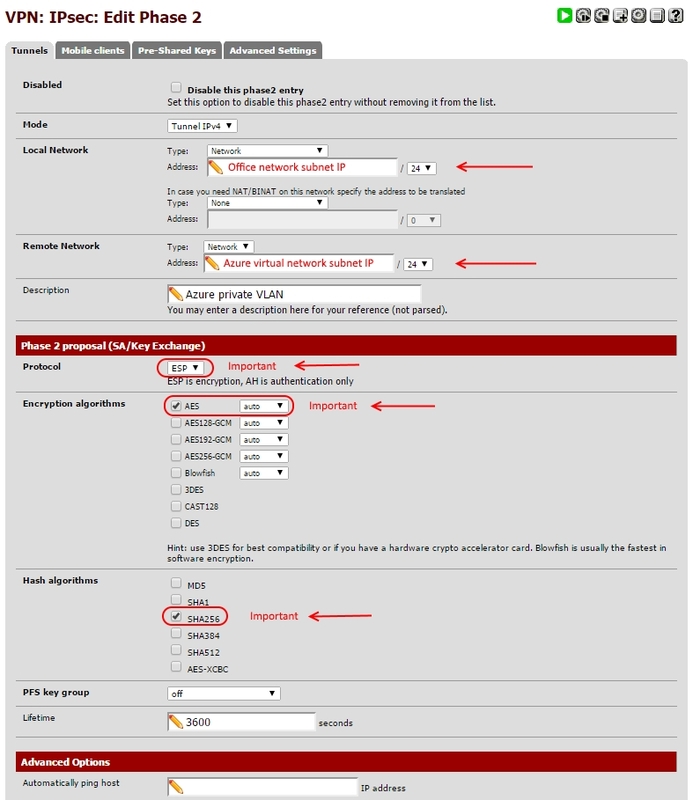 If pfSense and Azure gateway cannot connect most likely there is a mistake in a configuration. 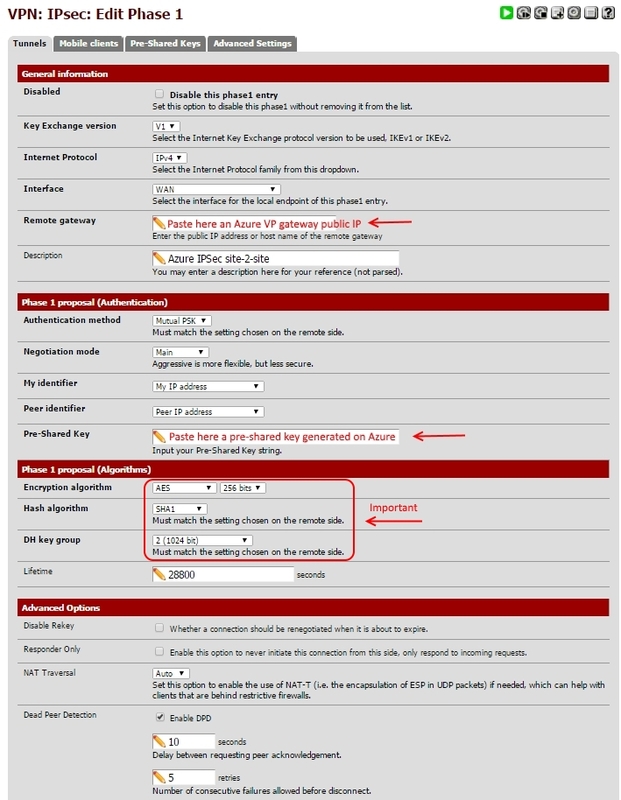 Verify thoroughly that all the pfSesnse settings are exactly as shown on the screenshots. 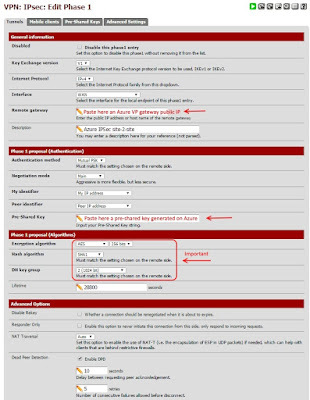 If you don't see required options in the settings your pfSense is outdated and you need to upgrade to a more recent version that supports all the required protocols and algorithms.